After reading through the recipe, I realized how much time it would take to complete, and got started right away. Unfortunately, my photographer couldn't spare 8 hours to document all the steps, so this one I shot myself. I made two batches at once, so I'd have one less to make next week. First step: butter block. I used organic butter, 3.5 sticks, and mashed them together as best as I could to form a large block. Then I rolled it out to a large rectangle and chilled it. Second: the dough. This was easy to make, just flour, salt, water, vinegar and a bit of melted butter. After an overnight rest, it was ready for rolling. The only challenge I ran into while rolling out the dough was a space issue. 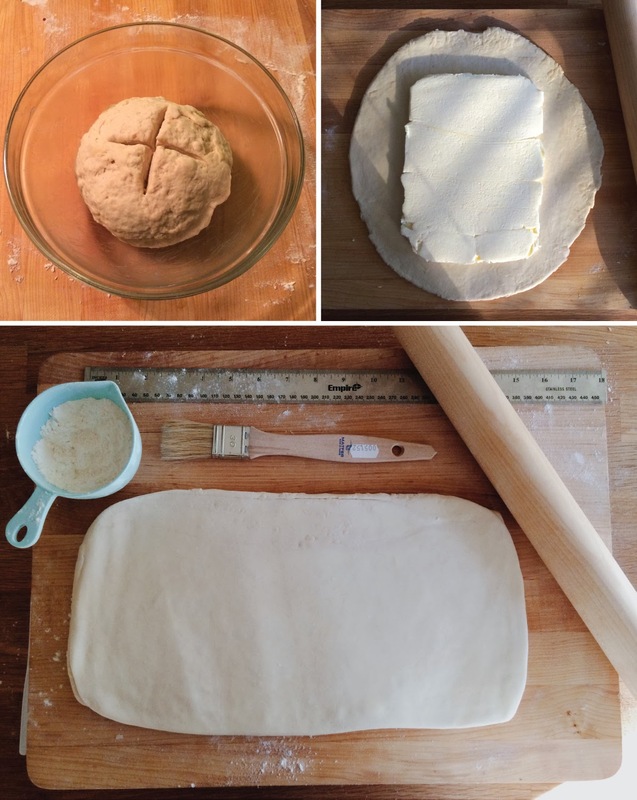 I have very little counter space, and rolling the dough into a large round first, and then into a long rectangle was difficult. I had to clear my counter of everything else just to be able to fit the dough. Other than that, it just takes time and some elbow grease to complete the turns. The dough transformed from a rough ball into smooth silky layers. I like the practice of poking the dough with your finger to mark how many turns you've completed, it's oddly satisfying. I can't wait to bake it, and was tempted to slice off a portion just to test it. I froze one batch for next week and the other is in the fridge for a few days. Next to pate a choux, puff pastry is also one of my favorite doughs to make. I was quite surprised by how long the wait time is between each turn and overnight. Those on the East Coast, this would be a perfect snowed-in project because it really is a full day process. If I count right its 8 hours/overnight after making the initial dough, 8 hours total for all 5 turns and 8 hours/overnight after the last turn. So its 24 hours idle time, which yes it doesn't require you to do anything but you just have to schedule accordingly. The only issue I had was wrapping the butter inside the dough. My butter block seemed rather large even though I measured it and the dough didn't extend enough so I had to roll it thinner than I would have liked, which resulted in the butter seeping through a bit during the turn process. I just tried avoiding putting too much pressure on these thinner areas and chilling when I needed. In comparison to the dough I've done in the past this is a very elastic dough and it requires some muscle to roll out. The dough smooths out very quickly after the first turn which is nice and the addition of vinegar does work well to keep it from oxidizing in the refrigerator so it doesn't have the gray appearance. Excited for this puff chapter!